North Seattle Trillium Award: Jenna Gearhart. As part of its Preservation Recognition Program, on Saturday, November 10, 2018 the Shoreline Historical Museum gave its 13th Annual Trillium Heritage Awards to four deserving nominees in North Seattle, Lake Forest Park and Shoreline. All of the award winners have worked to keep the historical integrity of their buildings intact, giving their surrounding communities a feeling of depth and meaning that might otherwise have been lost. North Seattle: 1937 photo of Lebanon House, now La Ba Te Yah Youth Home. The award for North Seattle went to the La Ba Te Yah Youth Home at 9010 13th Ave. NW, owned by United Indians of All Tribes. Program director Jenna Gearhart received the award on behalf of the organization. The La Ba Te Yah Youth Home was built in 1930 as the Lebanon House, a place for young women down on their luck. Because of the Depression and lack of funds, ownership of the building changed and it went through several transitions over the years: it became a convalescent center, a psychiatric hospital, and an alcohol treatment center, finally coming full circle to its initial use as a safe place for young people in 1991. Throughout all of the changes, the building itself has been maintained as an iconic neighborhood centerpiece, lending a real sense of historical character to the area. Lake Forest Park: 1937 photo of Cooper/Niles/Salerno Home. Accepting the award for a 100 year-old historic building in Lake Forest Park was Tiffany Salerno, owner of the 1918 Cooper/Niles home at 3710 NE 189th Pl. The home was once part of the 10 acre estate of the Hillandale School for Girls. Both buildings were built for Frank B. Cooper, Superintendent of Seattle Public Schools, and his wife Margaret, who opened the girl’s boarding school in the larger building on the grounds in about 1928. Frank Cooper’s son is said to have lived in the smaller house, and may have taught at the boarding school for a time. The house was purchased in 1936 by the Niles, where they lived for 22 years. Shoreline: Richmond Beach Market Street, ca 1915. J.T. Holloway Real Estate (2531 NW 195th Pl.) and James Holloway Grocery (2525 NW 195th Pl. ), far right. The Trillium Heritage Award for the Shoreline area went to two side-by-side homes - one built in 1898, at 2531 NW 195th Pl., and one built in 1900 at 2525 NW 195th Pl. Both buildings began life as commercial structures: the earlier building was Richmond Beach’s first real post office, and the second building was the James Holloway Grocery. These two buildings are just two of at least five structures that once existed on Market Street (NW 195th Pl.) that were built by John T. Holloway. This constitutes the core of the Holloway Historical District. 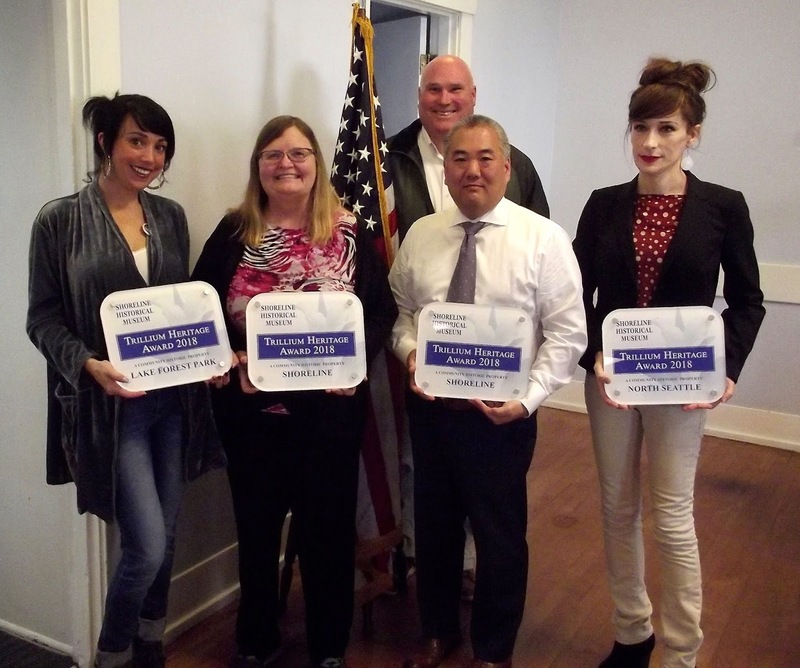 The awards were accepted by owner Doug Ito for the post office building, and owner Lauren Caldwell for the grocery building. These dignified buildings continue to reflect the community’s historic nature as a commercial center. The Shoreline Historical Museum’s Trillium Heritage Awards Program encourages excellence in the maintenance of historic buildings in keeping with their original style. Congratulations to the 2018 winners!